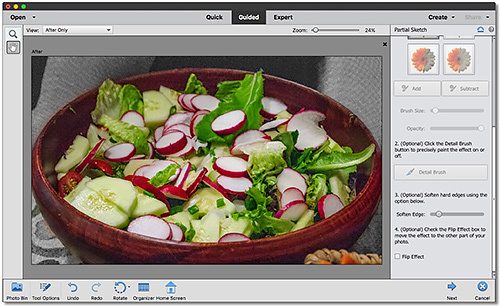 Autumn is when the leaves turn color, the air chills and Adobe releases an update to Photoshop Elements and Premiere Elements. The latest version (v17.0) has just been released after it was announced on Adobe's blog. We've already spent a few days trying out its new features. We call it Elements for a reason. At just $149.99 to license both products, the bundle is the real application, offering organizing, still editing and video editing. You can, of course, buy it as as 2-in-1 version (the Organizer in combination with either Photoshop Elements or Premiere Elements) but we've always recommended getting the whole suite. For the subscription squeamish, Elements delivers that suite at an affordable $149.99, which qualifies you for updates from any earlier version for $119.99. And under the hood, it's the same image editing technology that powers Adobe's Creative Suite. The installer was a bit of a pleasant surprise. For one thing, it highlighted the new features. Over and over and over. But we didn't mind being reminded. A new Home screen that "offers a personalized experience by surfacing info on what's new since your last version of Elements and content suited to your level of expertise." 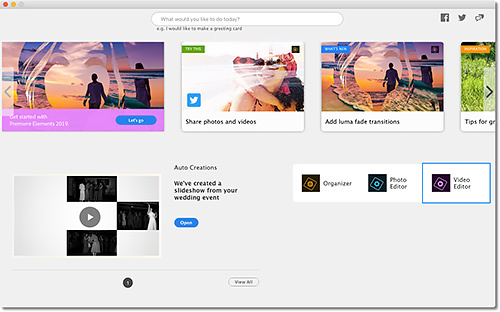 Adobe Sensei AI has been put to work on a new feature that automatically creates slide shows from your stills and videos, as well. You'll see them on your Home screen. With this version, when you launch Elements, you see the new Home screen. Home Screen. New things to try on top, Auto Creations and access to Organizer, Photo Editor and Video Editor components. The new Home screen doesn't replace the Organizer, which you can still access from the Home screen, but presents more of a drone view of the product and your projects. It also offers a prompt at the very top where you can type in what you want to do as if you were googling Elements for instructions. When we said we wanted to resize an image for the Web, a clickable list of over a dozen relevant Helpx documents (including a Guided Edit) appeared. That's a very welcome feature for those times you just don't know where to start or wonder if you've missed something important. Quicker Starts. Shows what's new since your last version, new things to try, ideas to test, help and tutorials and view auto-generated creations. Auto Creations. Beautiful photo and video slide shows and collages are automatically created from your library, highlighting moments like birthdays and vacations thanks to photo and video automation powered by Adobe Sensei AI technology. Auto Creation. Not a very impressive layout. We were also pleased to see the Home page tells you it's loading either the Organizer, Photoshop or Premiere workspace when you click on their buttons. That acknowledgement makes it seems like they are launching faster at least. 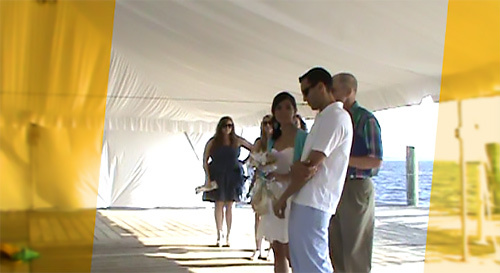 Shortly after installing Elements, we were alerted that it had created a wedding slide show for us. Google Photo's Assistant also automatically creates presentations. And we much prefer Google's because 1) they happen on the Google server not our local machine and 2) they are graphically more sophisticated. 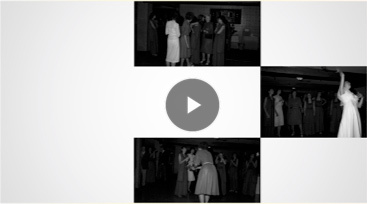 In our case, the auto creation took a set of black-and-white scans and turned them into a rather poorly presented slide show with music. The images themselves had not been edited and the slide show didn't optimize them. Understandable. But what disappointed us most was the simplistic layout and transitions. Five images, for example, were laid out in a checkerboard pattern, corners touching (as you can see above). 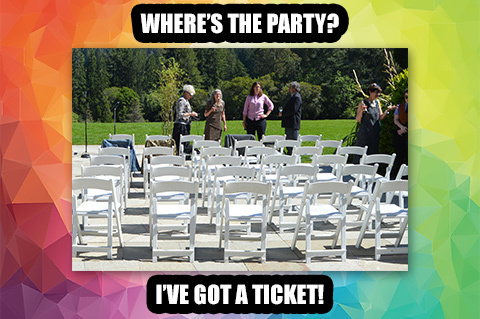 It did correctly identify the event as a wedding. Bravo, Sensei. But graphically, we hope the next creation shows a little more creativity. Redesigned Photo Collages. Create collages with fewer clicks and choose from stylish new templates that look great as Instagram posts and more. * Add frames and backgrounds for the perfect nishing touch. Multi-Photo Text. Design visual text that features a different photo inside each letter. The Guided Edit helps you adjust and resize your photos to make words or names that work as wall art and on cards and scrapbook pages. Memes. Get help turning your photos into memes for sharing on social media. Type in text and add filters, borders and more. Meme. A fun thing to do. 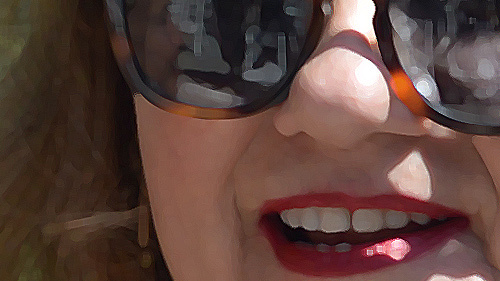 Turn Part of Your Photo Into a Sketch. Get step-by-step help brushing on the medium or look of your choice, including pencil, colored pencil, old paper and old photo. Sketch. 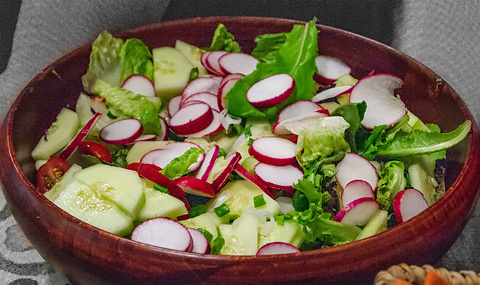 We left the salad alone and turned the background into a 'sketch' but it seemed to just drop the color. Add Text and Border Overlays. Embellish photos with borders and text to make them stand out in print and on social media. Better Performance and HEIF Support. Experience faster installation as well as faster performance throughout common tasks. And now you can import and edit HEIF images on macOS. Elements has always felt slow on our MacBook Pro 8,1 despite having 16-GB RAM and plenty of disk space. Last year's update improved things a bit and this time around we were able to try things without much delay. Among the things we tried were Raw processing and a few Guided Edits that intrigued us. But first let's look at the Preferences for performance. After a while using Elements, we realized most of the waiting we did was for launch times rather than any editing functions. In that regard, it's interesting to peek at the Preferences for Performance. Of note here is the ideal RAM range of 7K to 10K. It may be based on our available RAM of 14K on a 16K system, so a smaller amount of system RAM may function as well. 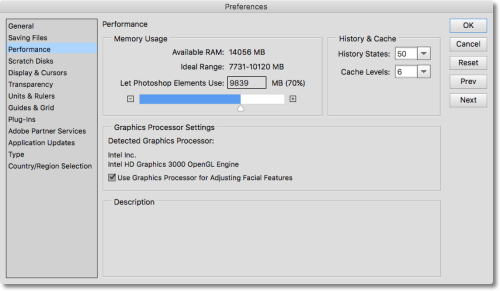 Also of note is the GPU setting, something we've had trouble with in Lightroom. On our system it was enabled by default for Adjusting Facial Features. That's a very limited usage for a GPU these days. But there isn't much we could optimize here so we left the default settings alone. 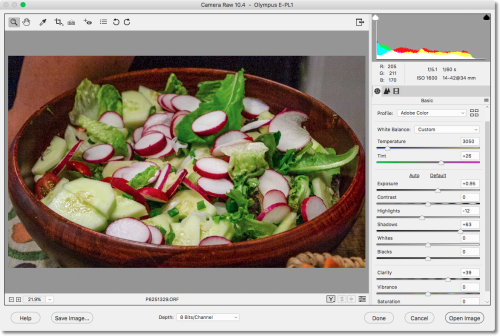 Elements uses Photoshop code including Camera Raw, so we thought we'd take a peek at its Camera Raw interface. As ou can see from the screen shot, quite a bit of the current Camera Raw from Photoshop is missing. Among our favorite Basic controls, the Dehaze slider is missing. And there's no Upright tool for perspective control either. On the plus side, there are the current Camera Raw profiles plus the profile browser. 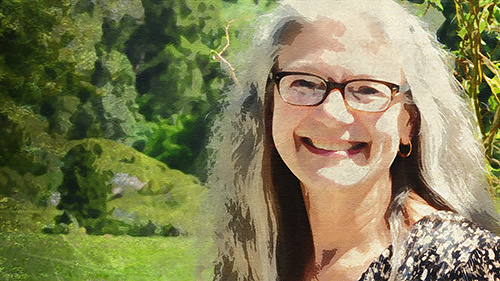 We have a real weakness for watercolor conversions of digital photographs. We like the abstraction and flight from pixel-peeping detail. So we gave it a shot. The Guided Edit itself was clear and easy to follow. But we were disappointed not only by the default rendering but even by the adjustments we made. Partly this was because we were not working on the image at 100 percent but with a fit-to-screen view. That obscured the smaller details. You can see the problem even in the crop version below compared to the 100 percent crop version in the rollover below it. Cropped. Just a small fraction of the full frame. 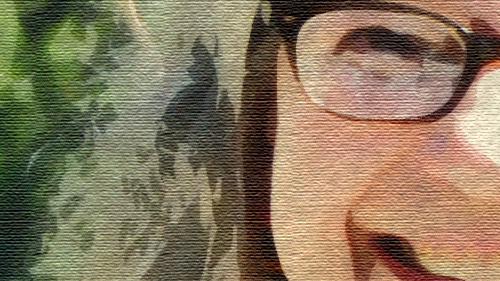 But look at the 100 percent cropped version of the watercolor below. And compare it to the Guided Edit for a painting. As we worked on the image in both Guided Edits in fit-to-screen view we didn't notice much of an effect, but at 100 percent you can see the difference. What Elements doesn't tell you about this is to consider your output plans. For a 500-pixel Web image, you might want to reduce the size of your image before starting the Guided Edit. We expected the Sketch Guided Edit to convert a selection into a line drawing but it seemed only to drop the color from our selection. Sketch. Select among four effects, make your selection and refine it. The selection was fairly crude and seemed based more on tonality than color. So it confused the edge of the bowl where it ran into dark areas of the background. We were able to adjust for that but not as precisely as we would have liked. Feathering the selection and then reducing the images size for this story minimizes the issue. But we felt the Guided Edit fell well short of our modest expectations. Make Glass Pane Effects. Add a video overlay to create a wipe that makes it look like the action in your scene is taking place behind glass. 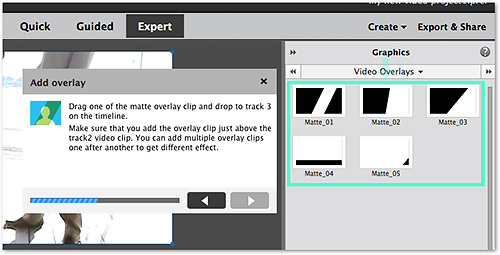 Create Luma Fade Transitions. Create a dramatic scene transition by fading in the colors from darkest to lightest. Better Performance Plus VFR, HEIF and HEVC Support. Experience faster installation as well as faster performance throughout common tasks. And now Premiere Elements supports variable frame rate plus import and editing of HEIF images on macOS and HEVC video on macOS 10.13 and above. Redesigned Quick Edit Mode. Quick Edit mode leads you through the steps of trimming a video or using the simpli ed Sceneline to combine clips, photos, titles, music and more into a unique production. Two New Guided Edits. Get step-by-step video editing help with 20 Guided Edits, including 2 new ones. We tried the new Glass Pane Guided Edit on a clip. It's a complex edit we would not have been able to have accomplished without the Guided Edit but we didn't miss a step, following the instructions with highlighted hints. Guided Edit. The Guided Edit pops up a window with instructions and highlights interface items in green. The final clip set a yellow cast on the frame which was broken by a clear glass pane that slid across the frame, highlighting the main action. When we finally played the clip with the effect, we were impressed at both how good it looked and that we had actually accomplished it, given the complexity. Glass Pane. A nice effect which, in this case, we filtered through a yellow cast. That complexity includes picking options recommended by the Edit that we were not familiar with but is also included creative options we could choose among and later edit. We will note that our camera AVI clips were not recognized by Elements but our camera MPGs were. System requirements haven't changed very much from Elements 15. The minimum OS version is a point release higher but if your hardware ran the previous version, it should run this one, too. Mac OS X v10.12 through macOS 10.14 are supported. 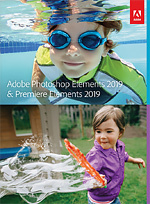 Adobe Premiere Elements supported import/export formats include: AVCHD (import only), DV-AVI (import/export on Windows), DVD (Windows only), H.264, HDV, MPEG-1 (import only), MPEG-2, MPEG-4, MP3, QuickTime (limited codecs), Windows Media (Windows only) and more. One thing that never seems to change about Elements is the price, we wrote last year. And it's still true. Photoshop or Premiere Elements 2018 is available for $99.99 from the usual sources. Upgrade pricing is also available for $79.99. The Photoshop Elements & Premiere Elements 2018 bundle is available for $149.99 with upgrade pricing of $119.99. We're always glad to get the email announcing a new version of Elements is about to be released. From the first version, it promised to educate us not just about what we wanted to do but what we could do with our images and video. In recent releases education has taken a back seat to productivity. The Guided Edits, which are the one reason to seriously consider Elements, are step-by-step instructions with little explanation. But you can learn from them, all the same. And that's enough to earn Elements three corners.